This was a day of the unforeseen. We all have days like this. When something occurs, so out of the expected, that there’s not really a way to put your reaction into words. Taryn and I headed to the medical facility in Tacoma. I was familiar with this campus from taking my oldest son there when he was young. I felt prepared for the drive, prepared with the small details as to where to park, and ultimately, prepared to hear that my daughter may need a helmet. When they called us back to the exam room, I wasn’t nervous. Not at all. The doctor came in and immediately began looking at Taryn’s head, feeling all around as he made some small talk. After feeling around for a bit, he sat back surprised and said “I’m not sure why they sent you to my office, it seems she should be seen in our plagiocephaly office, where you’ll get fitted for a helmet.” My heart sank a little. Knowing what I know now, I feel embarrassed to even say that was my response. I should have been jumping for joy. You see, I was frustrated that we wouldn’t have a resolution that day. That I might have to wait to see another doctor. And, that I had wasted time waiting for this appointment, when it really wasn’t what was needed. Just as the doctor was finishing up, he paused as he felt the back of Taryn’s head. “Wait a minute…” he whispered. The sudden concentration of the doctor took me by surprise. He started feeling around more and looking at her from different angles. “I see something different that I didn’t see before. Actually, I think your doctor may have made a very good recommendation for you to come see me.” He swiveled around to look at me from his stool with a serious look on his face. “I think her right lambdoid suture may have fused prematurely, which is called Craniosysnostosis. When this suture closes, it is most often missed because it presents so closely to plagiocelphaly.” Those words, they didn’t mean anything to me yet. I pushed down the fear in my chest, not knowing what I was being told, but not wanting to be overly concerned. The doctor began explaining that surgery was often needed to relieve the pressure on the brain, so developmentally Taryn could thrive, like a normal child. Bricks. A million bricks fell from the sky, right onto my chest. I swear I felt my heart stop. I couldn’t breathe. Surgery — wait weren’t we just here for a helmet? As the doctor continued I remember trying my hardest to keep it together. Silly things, like squeezing my hands together so that I wouldn’t let my tears fall from my eyes. The doctor went on, explaining that this is a “serious surgery.” That it would be intense. That they would remove half of my daughters skull and switch the sides. She would have an incision from ear to ear. Nine months is about the perfect time for this to occur. 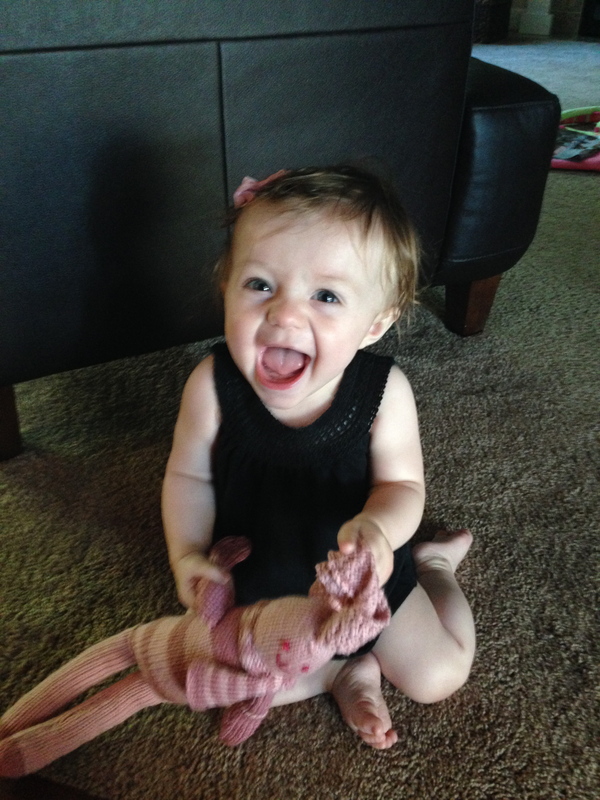 She will likely have a blood transfusion… and I lost it. I couldn’t hold it in. It was surreal. Tears began to fall. I couldn’t process my thoughts. The doctor politely handed me a box of kleenex, I could have used the entire box. I knew I had to pull myself together and somehow, I did — just enough to finish the consult. We would need a CT scan to fully diagnose. The doctor stepped out of the room to grab his camera to take pictures. When he did, all I could do was text my mom quickly “Something is wrong.” I had to tell someone, and I wanted it to be George, but I knew he would want to talk ASAP, and I couldn’t yet. After some pictures of Taryn’s head and plan for the CT to be scheduled, we were almost ready to go. I knew they would have to sedate Taryn for her CT scan because there was no way she would hold still. The kind nurse warned me that it could be hard to see the sedation. I was grateful for the warning, but none the less it caused more tears. When I finally gathered myself and Taryn all together, we walked back to the parking garage. Of course my mom had blown up my phone with texts. She already had a prayer chain going, and the words of kindness I received instantly saved me. I had a plan to tell George as soon as I could, after I calmed down. I knew he would be worried, but if I couldn’t speak, it wouldn’t do any good. My plan yet again didn’t go as I expected. As if he had a sixth sense, George called as soon as I put Taryn in the car and dropped my head into my hands in a full on breakdown. I knew I needed to answer. The poor guy, trying to discern what I was saying between sobs, in a parking garage with poor reception. I did my best. When I was finally collected enough to drive we headed home. Against my better judgement, the researching began. The forums, Google-ing like crazy into the night, trying to understand what “could” be happening, what we might have to go through. Part of me wanted to believe that the doctor over-shared. What if Taryn wasn’t a positive diagnosis, and I had gone through all this. But, deep down I knew that the doctor shared what he did because her symptoms were clear after further investigation. The more I researched, the more I realized Taryn’s symptoms matched completely with Lambdoid Craniosynostosis. We scheduled the CT scan. George remained calm, as one of us needed to. And then we waited. We waited on the next step in our long journey. This next small step, a CT scan with sedation scared me enough that I had no idea how I would handle a surgery.